After surviving Hurricane Harvey, Beatrix went to a rescue organization in Colorado and then came to Best Friends. Since coming to the Sanctuary, Beatrix has gotten much more comfortable with meeting new people than she was at first. She does best when she meets people in a neutral location outside of her room or yard. Treats and baby talk also help put her at ease. Though she would likely do best in a home with adults only, once she gets to know her people she gets very excited to see them and will immediately grab the nearest toy to show them. She is happiest with a squeaker toy in her mouth and is the type of dog who will be your friend forever once you've bonded with her. Born in 2016, Beatrix is a little bundle of energy and loves to run the agility course at Dogtown and play with her toys. She's recently started to play with a toy that lets her chase and catch a toy at the end of a rope. This helps her focus her energy even more. She is eager to please and excited to learn new tricks. She knows 'sit,' 'down' and 'sit pretty.' Besides agility she likes to do nose work, a fun search and scenting sport. When she is done running around, Beatrix wants to crawl on your lap and is just happy to be where you are. 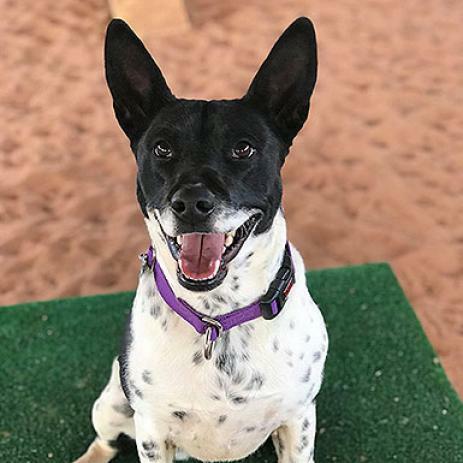 She was very reactive to other dogs when she first arrived at Dogtown, but with training, she's improving at meeting them and, once she knows and likes a dog, she's very silly and playful with them. She'll need to meet any potential doggie siblings before going home with them but she could certainly bond with the right one.